Rooms in Santa Margarita beach, Roses (Spain) -spa included! Rooms with partial sea views. Comfortable and cozy rooms with care and exclusive decoration. All of them have the necessary elements to offer the most comfortable stay. The rooms of this type offer extraordinary front views to the Mediterranean Sea. Single room with two single beds or a double bed and independent terrace with views of the beach and the sea. All the superior rooms are spacious, comfortable, bright and with a terrace with partial views of the sea. 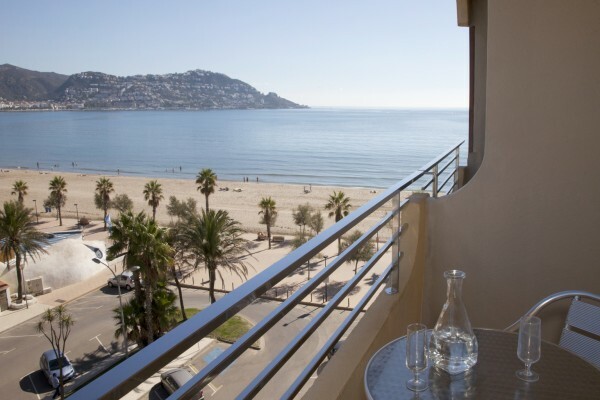 Spacious rooms with panoramic views of the Mediterranean Sea. Comfortable, bright and with a large terrace. It has everything necessary to offer the most comfortable stay. Ideal for couples traveling with children or with teens, the side communicating rooms offer two full and connected rooms that can accommodate up to 6 people. All have a balcony, safe, satellite TV, full bathroom and telephone.